Mordian 7th Regiment: Heresy Era Imperial Fists - First wave of models arrives! Heresy Era Imperial Fists - First wave of models arrives! Huzzah! 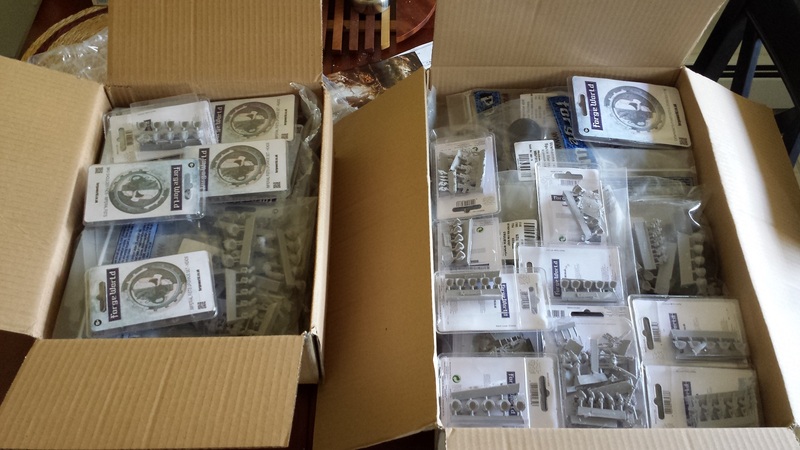 The first batch of miniatures for the Imperial Fists have arrived from Forge World and there was much rejoicing! ...Followed by many many hours of soaking, washing and scrubbing, a couple emails to FW about a few mis-packed minis, and a fair bit of swearing as I stabbed myself pretty good with an exacto blade cleaning up some casting gates. I decided to lead off with the 20-man assault squad, as it is comprised of a set of models I hadn't worked with before - I quite like the sleek look of the Mk IV assault marines, I think they'll be a good counterpoint to the more solid looking Mk III tac marines and breachers. Decided to go with power weapons as the squad upgrade path on these, a pair of power swords, a pair of power axes, and a power fist for the sergeant. 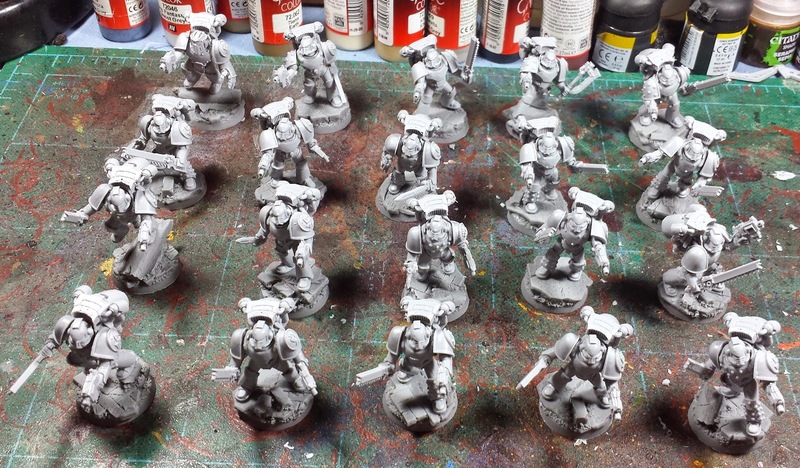 Unfortunately there were several issues with the order that FW sent me - instead of the Cataphractii terminators I got Salamanders Firedrakes, and half of the MkIII Strike Force models were mis-labeled MkIV tac marines. A quick email with some photographic evidence of the issues out to FW later and they've already sent out the proper replacements - say what you will about their quality control, I have never had a company more responsive to email and quick to rectify any issues! It's supposed to be absolutely gorgeous out over the next few days, hoping to get some more models built and primered so I can get some paint laid on 'em over the weekend! Yes yes yes! FISTSSSSSSS! I'm excited for this project, as I'm going to be doing the first templars, using the fist kits as a basis! Those look cool so far. Where are the bases from again? Just battling through some Mk4 Assault Marines myself. @Greg Hess: Nice! Definitely looking forward to seeing 'em! @Damn The Valley: I hear ya man, The ad-mech pics dropped while the Fists were inbound, and I'm pretty sure I'm gonna have to get some of the new plastics too. Aaaah, my wallet! @Dai: Thanks man - the bases are from http://www.fantascape.co.uk/ I'm quite pleased with 'em, will definitely be ordering from them again! @Sir Tainly: Cheers! I'm digging the MkIV models - they're a little thin compared to the MkIII but I love the design.